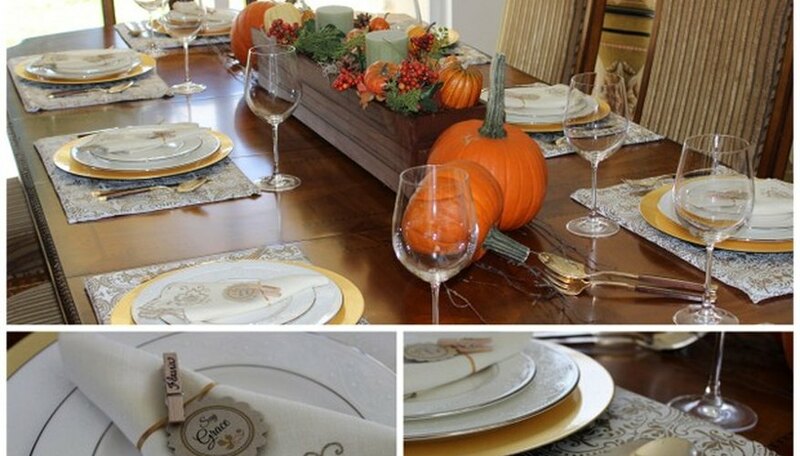 Did you know you could set the perfect Thanksgiving table using items around your house or backyard? Couple this with pumpkins, gourds, and other fall decorations and you'll create a truly festive table. Before heading to the store, check for items that you already own or search the yard for leaves, twigs, or pine cones. 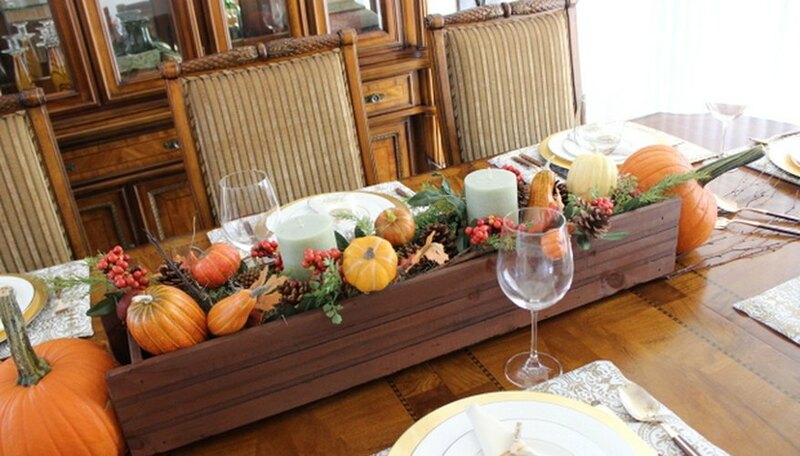 Bring the nature in and create a beautiful Thanksgiving tablescape on a budget. Fill the bottom of the window box with moss. This will give it height and make a 'bed' for the candles, leaves, pine cones, and gourds. Any other floral craft material or even wrinkled craft paper could work as well. The moss serves as a filler for the centerpiece. Place the candles and use your imagination. You can separate them evenly, or arrange them any way you'd like. You can also use different sized candles placed off-side for a different look. Proceed to fill the box with natural or faux decorations such as berries, pine cones, small gourds, and leaves. If you have a fall garland, fold it in half and lay it on top of the bed of moss. 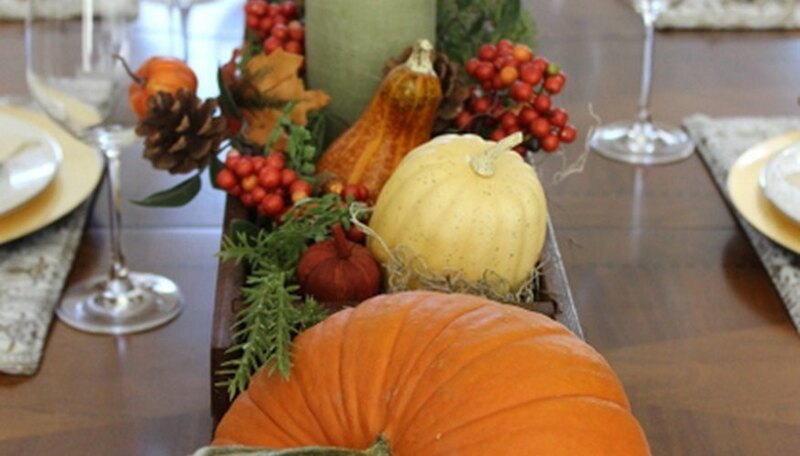 Add faux or natural gourds. Flank each end of the box with the pumpkins. Use a tablecloth or place mats to set the table. Gold plate chargers add elegance and match the vintage silverware. For a finishing touch, tie linen napkins with custom tags. Make Thanksgiving napkin ties using this free printable. Print the design on card stock or a contrasting shade of paper. Using a scalloped punch, punch a small hole on top and thread with ribbon. Use baking twine for a more rustic look. 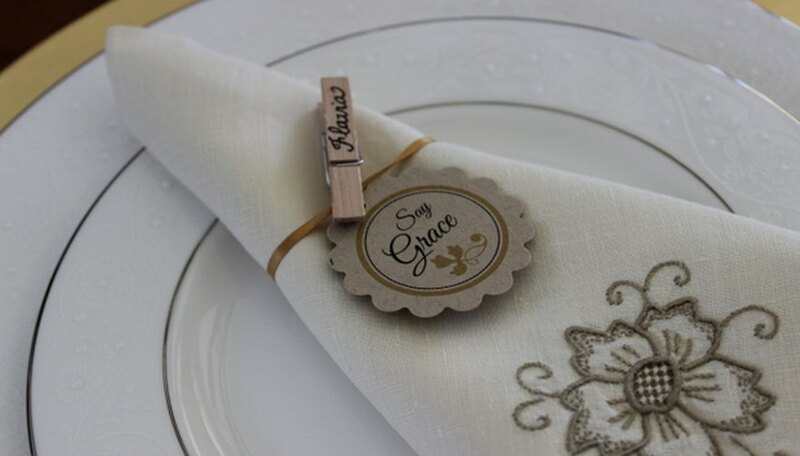 Write your guests' names on a clothespin using a felt point pen and attach it to the top of the tag. Create a dessert and coffee station on top of a buffet or console table. If you don't have a buffet, use a small auxiliary table or bombay chest. Set dessert plates, silverware, and coffee cups next to the station. 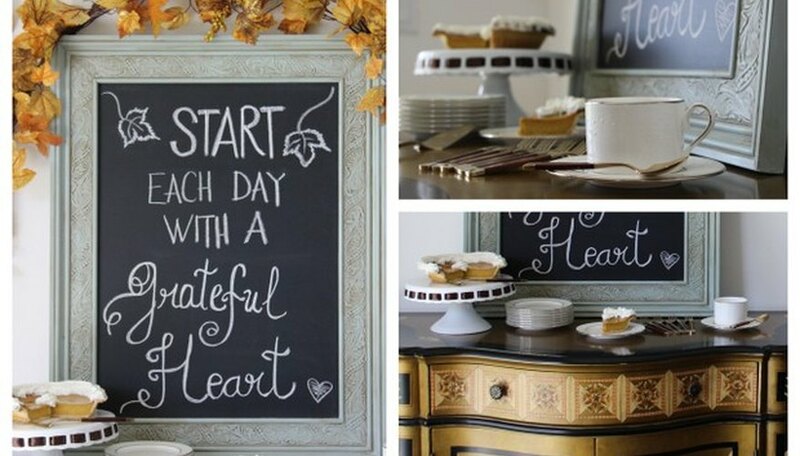 A message on a chalkboard frame in the background sets the mood for a memorable Thanksgiving dinner. Think outside the box. In this example, a window planter box makes a statement (and it was free!). Bring the outdoors in! Use dried leaves, twigs and pinecones for a festive centerpiece. When using natural gourds and pumpkins for decoration purposes, wash them first with a mix of bleach and water to kill mold and bacteria. This will prevent them from rotting quickly. Search your (or your parents'!) house for vintage finds such as table linens and silverware. A buffet is ideal to hold extra plates, desserts, glasses and silverware. If you don't own one, move any other auxiliary table or chest to a corner and create a cozy little dessert nook. Flavia Andrews has a Bachelor in Science degree in industrial engineering. She has experience in the construction and home remodeling fields. Her passion for home decor and DIY projects launched her writing career in 2010. Flavia's work has been published in Cosmopolitan Pregnancy and featured on HGTV.